Since updating to ver 6559 I get the subject message when I attempt to read an archrived backup. All my backup are "full" backups. I get this message and have to point to backup souce at every level ( C-drive-point, Documents-point, etc). Takes forever to get to a particular file. I reloaded ver 6559, no help. Then uninstalled and reloaded, no help. Then uninstalled & ran clean utility, no help. How can I fix this, or go back to previous version of TI 2016? The backups validate ok, but this has stared since 6559. William and Graham, please download a copy of the Log File Viewer App from this forum and use this to check the logs for the backup tasks that you are seeing this error for. This should help to identify what is happening here. Please post copies of the log files to the forum using the File attachments option below so that we can advice you further. There are no errors in log filer either before or after reading archive backups. My gut feeling is that this problem is wide spread but not normally encountered, most users don't routinely read files from archives, just back them up. I reverted to ATI 2015 and it works fine. Went back to 2016 and problem remains, even after manually deleteing any ATI referances I could find in registery and C drive. I've purchased every ATI version since 2009 and there has been inital gliches in each, I'm hoping that the ATI team can fix this one also. I really like the form & function of 2016 prior to 6559. Please look in the C:\ProgramData\Acronis\TrueImageHome\Logs folder for the log files (assuming you are running Windows 7 or later) - this may be a hidden folder path on some systems - change the folder view options to allow hidden files & folders if so. See KB Document: 49484: Acronis True Image: Finding and Analyzing Logs if you have a different OS. Not sure why you attached a copy of the Log File Viewer zip file - I am using this without issue. I need to step back a little here and ask the question: how are you 'reading archives'? I want to make sure that we are using the same terminology here, I was thinking that you were looking at backup image files, i.e. .TIB files but now I am not so sure - are you using the Archive function within ATIH 2016? The reason why the initial Log File Viewer page shows no logs is simply that there are no service_*.log files in your log folder listing and this is the default view for the viewer. You can switch to look at other log file types by clicking on Log Type in the top menu bar and selecting a different type to look at. Some log files are ongoing, i.e. they log events over a wider period of time rather than being created at the time of an activity. Nothing to go by, via what has been posted so far. However, v6559 upgrades seem to be getting blocked/partially blocked my different AV programs (something that has not been an issue with past versions). If you upgraded througth the Acronis app with AV turned on, I would download the 6559 installer from your online account first. Then temporarily disable AV and run the installer with right click and "run as administrator" access. If given the ability to repair, please give it a try and then enable antivirus again. Alternatively, with many people getting bad upgrades from the AV blocking (especially when upgrading through the app prompt), I would recommend uninstalling and reinstalling with the cleanup tool and starting fresh. this may solve all of the current issues you're experiencing, and perhaps some others that may not have presented themselves yet. 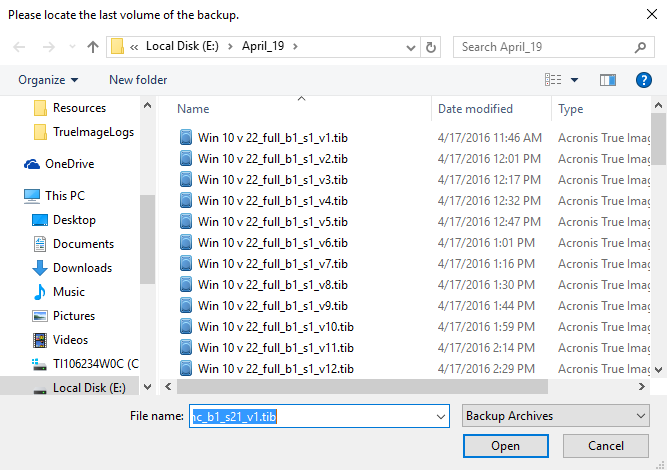 Unfortuantely, you'll have to create new backup jobs again (existing backups willl still be good for recovery though and/or can be imported back in and then configured). But, hopefully, you'll have a much more stable and properly working Acronis application as a result. Steve, I'm using Windows file explorer to open saved "full" backed up TIP files stored on a USB hard drive. Some made recently with ATIH 16, others with ATIH 14 & 15. When I select a paticular TIP file a pop up windows asks the last volume backup. The window is populated with the correct full TIP name so I only have to select open to get to next level of tree ("C"). Then double click "Users" file and same windows pops up. Repeats down the tree. Almost acts like it's treating it as an incremental backup and looking for last version, instead of a single (full) version. When I revert to ATIH 2015 all works normally. Thanks for the tip on using the log viewer, nice program. As long as I'm been using ATI, I never knew this forum existed. Learning a lot browsing thru old posts. Almost a good trade-off for having this relatively minor problem. I'm going to try Bobbo's tip of killing my anti-virus program and doing another clean install. If no luck, I found a previous version of ATIH 2016 in my download files. Hello William, thank you for the clarification on the steps you are taking for this issue. I have just tested this on my own Windows 10 system with ATIH 2016 build 6559 and using Windows Explorer to navigate inside my full backup image files and all worked fine without any pop-up windows asking for the last version etc. One thought that came to mind from doing this - how is your external USB hard drive formatted? Is it formatted with FAT32 or NTFS for the drive file system? My drives are all formatted with NTFS which means that my backup image sizes are held as a single file without any need to split the size due to file system limitations. If you have a FAT32 formatted drive, then your backup image files will be split into maximum 4GB file chunks, and this could trigger the sort of message you are seeing. You can do a quick check in two ways, look at your backup image file sizes - are any larger than 4GB? Alternatively, right-click on Computer (or This PC) and select Manage (to open the Computer Management console), then click on Disk Management and look at your backup storage drive and you will see either NTFS or FAT32 shown in the panel. William, there is a .tib mounter patch available for 6559. It's supposed to be specifically for "mounting" .tibs, but I'm wondering if it may also help with navigating the .tib's in explorer. It's an MSI installler that can be run and installed outside of Acronis - may be worth trying it out. Also, some users are having issues after "upgrading' from within the Acronis app with their AV enabled (as it is blocking part of the installer). You may want to disable AV temporarily, download v6559 from your account and "run as administrator" and try to repair the installation to see if that provides any better results if the patch above doesn't do things on its own. I get exactly the same behaviour as Willam, and I have backups both on an external RAID USB drive, and on an internal Wedstern Digital 2Tb hard drive I use for quick saves. (My hard drives ae all hor swap) All are formatted to NTFS. Backup files sizes range from about 8Gb to 180Gb. The behaviour is shown with 'full' backups, which previously could be browsed with explorer without any query as to the first volume (what would be the point?). The errors I mentioned in my first post log as application errors in the Windows event system are new since 6559, and refer to failures in either QT5Widgets.dll or QT5Core.dll in TrueImage.exe. Also new since 6559 are the log errors for the backups e.g. Although it also reports e.g. Nothings changed on the machine materially for 2 years except Windows and other updates. I'm running Win 7 64bit Pro. All this points to 6559, IMHO. 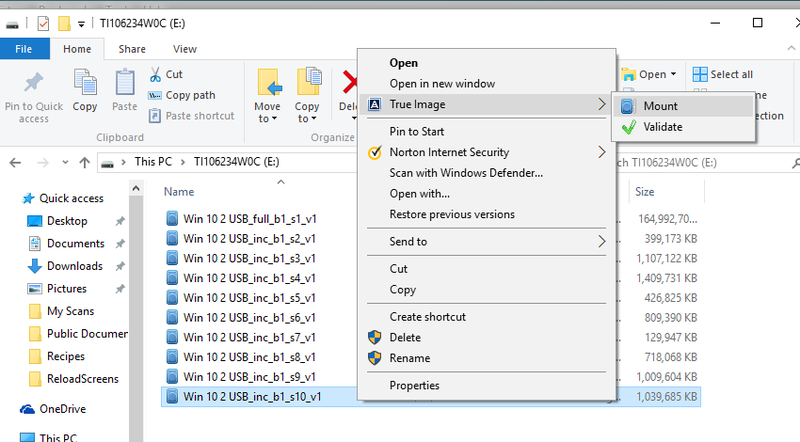 Bobbo's TIB mounter patch addresses the issue of accessing data in an image copy, but backups still have the original problme which startd tis thread in Windows explorer. Does anyone else have the issue, or might it be something on William / my PC's ? Also, as I indicated, errors now occur in the Acronis log file and the Windos Event log which are AFAIK new since the upgrade. My Machine is i7-2600 liquid cooled, 16Gb DDR3, 3x 2Tb Western Digital drives + OCZ SSD cache (not system disc) . Win 7 64bit Pro, fully patched. AV is McAfee + Malwarebytes. The data appear ok, so it's largely an irritation rather than some functional stopper. I get the same error message when I double click the .tib file. However, I can right click and mount the image no problem. I have to admit I've experienced this before as well (in the past though). Sometimes, I would point it to the same .tib it is asking for and it would open, sometimes it would prompt me to locate it again. I would cancel until it stopped bugging me and then it would open up as expected. Could very well be a bug still. Are any of you able to point it to your existing .tib again and have it open, or if not, cancel, but then it actually opens up like it's supposed to after that (perhaps you have to point it to the same file at least once for this to work). There is another update for tib_mounter driver, see http://forum.acronis.com/forum/116874#comment-357378. If it does not help, the issue with exploring backups could be be provoked by damaged database of the software. In such case instructions from https://forum.acronis.com/forum/99525#comment-324836 should address the problem. Hi Slava, I just ran into this issue after a repair of the application. After the repair, the app would not load so I renamed the database as have done in the past. I am now getting this same behavior with v6559 too. I just sumbitted feedback with screenshots as well. I will try renaming the database again to see if that helps or not. I did not runt the taskzap because I was hoping to not have to start all the tasks again. The main problem with recreating the tasks or importing a backup is that when you have multiple version chains... it seems like you have to import each chain individually and cannot have them all as part of one task again - is that correct, or should I only import the first chain, or only the last chain? This may help resolve the issue. Nice, issue solved for me! I've been running the previous build as multiple tries to run latest version gave the "please locate" issue. Following your instructions, I deleted the two files in the Database directory & allowed Acronis to upgrade to 6569. All is well now, thanks. I'm assuming that the "clean" tool, which I previously tried, did not delete these files. Dmitry's suggested fix worked for me. Dmitry's suggested fix also worked for me. It worrked for me too. Almost 2 years since and the gratitude is still coming in, Dmitri. ATIH 2016. Deleting those files made exploring .TIB files work again. However, I had to restart the W10 laptop before some "COM surrogate" would let go of 3 files for long enough for me to remove them. I still wonder if the mysterious "COM surrogate" might be related to whatever keeps using my external USB HDD, causing "unsafe" warnings when I want to eject the drive. My suspicions include Acronis True Image Home, but it I also wonder what Kasperky Total Security gets up to. Eventually my prejudice turns against Windows "Photo" which seems to think it can run around sticking its nose into everything looking for images for its albums. Why search every time? ich hatte das Problem mit Acronis True Image 2017 und Win10 64Bit. nach Neustart konnte ich *.tib wieder mir dem Explorer öffnen! Database bleibt bisher immer leer ..aber alles funktioniert.